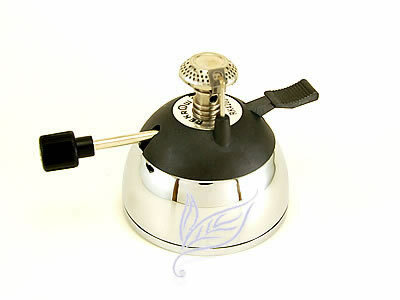 Rekrow RK4203 Butane Micro Burner - An ideal burner for cooking, camping, syphon coffee maker, and laboratory applications. • Refillable 30 - 35 gms butane fuel tank. • Working Time : about 45 minutes. 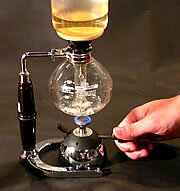 When using butane micro burner on syphon instead of spirit lamp, for safety reason, please read all the instrution manual first before use. It is highly recommended to position the upper bowl at an angle (not fully set in place) before water boil. Let the filter metal chain touch the glass bottom. This metal chain can conduct the heat into the water and speed up the boiling time and avoid the glass from direct heat. It is also an easy way checking if the water start boiling and help to limit bumping water. When water goes into the upper bowl, decrease the flame just enough to keep the water up north. Since sustained extreme high temperature from butane burner (it can attain to 1,300°C or 2,400°F) might crack the lower bowl.